Playing golf with the Back to the 50s Mini Golf in Branson, will let you to travel back in time as you enjoy your favorite mini golf game. Back to the 50’s Mini Golf is clean and affordable miniature golf course that you can easily play on your next visit to Branson. Located in the heart of Branson, this challenging 18-hole mini-golf course features a peaceful setting that is fully packed with classic 1950s décor. Ideal for small families, this affordable mini golf course offers an old-fashioned game of mini-golf set to the tune of favorite golden oldies in a convenient location. As one of the newest miniature golf courses in Branson, this putt putt mini golf course provides plenty of fun and obstacles for your next round of golf. This 1950s-Themed Miniature Golf Course in Branson takes a step back in time as you step up to play a round of golf on one of the most fun courses in the area. With this mini golf course, you can putt your way through the obstacles and hazards as you make your way through and around the various items on the course. The items around the course are modeled after one of the most famous eras of our time, the 1950s. Golfers who choose to play at the Back to the 50s Mini Golf will find it not only fun and memorable, but it also offers the best deals and values to enjoy the fun with the mini golf that you will experience in Branson. As one of the easiest and the most accessible mini golf course in Branson, this attraction is beautifully nestled alongside the famed Highway 76 Strip. The course is within walking distance to many of the area’s exciting city attractions, live shows, leading hotels, retail shops, and fine restaurants. In the area, you can easily park and play, then you can walk your way to the course or get to enjoy some of the other fun things that you want to do. In Branson, there’s no mini golf course quite like the Back to the 50’s Mini Golf. Aside from being a home to championship-level golf courses, Branson is also famous for its excellent selection of mini golf attractions. In Branson, there’s something for every young golfers, with simple straightforward shots, and there’s also something for older fan of this favorite past-time, as well as something for the mini-golf enthusiasts. Around Branson area, you will find several mini-golf courses operated by hotel properties for their guests and there are also big mini-golf operations that are open to the general public. Regardless of your skill level, Branson has the mini-golf course that’s ideal for you. 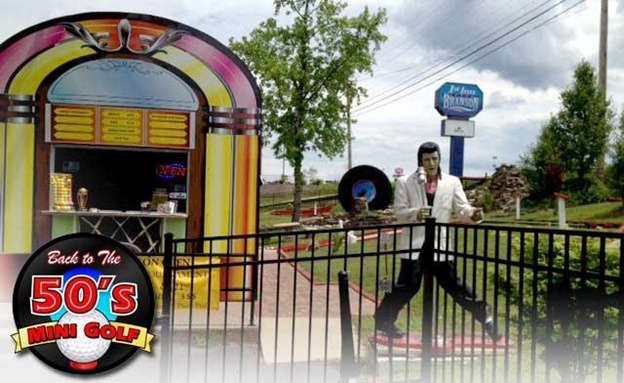 So, if you play a round of golf at Back to the 50s Mini Golf Course in Branson, you will find the 18-hole mini-golf course in a serene setting that is fully packed with classic 1950s décor that will make you travel back in time.